Lush Hawaii deserves a wall map that showcases this state's beauty. 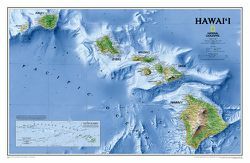 A visually stunning map, the Hawaii Physical Map shows all eight of the major islands and includes an inset of the entire chain of reefs stretching nearly 3,000 miles across the central Pacific. In addition to showing all the major land features, the map also shows the Hawaiian Ridge shelves underneath the islands, providing a wonderful perspective on how the islands were formed.